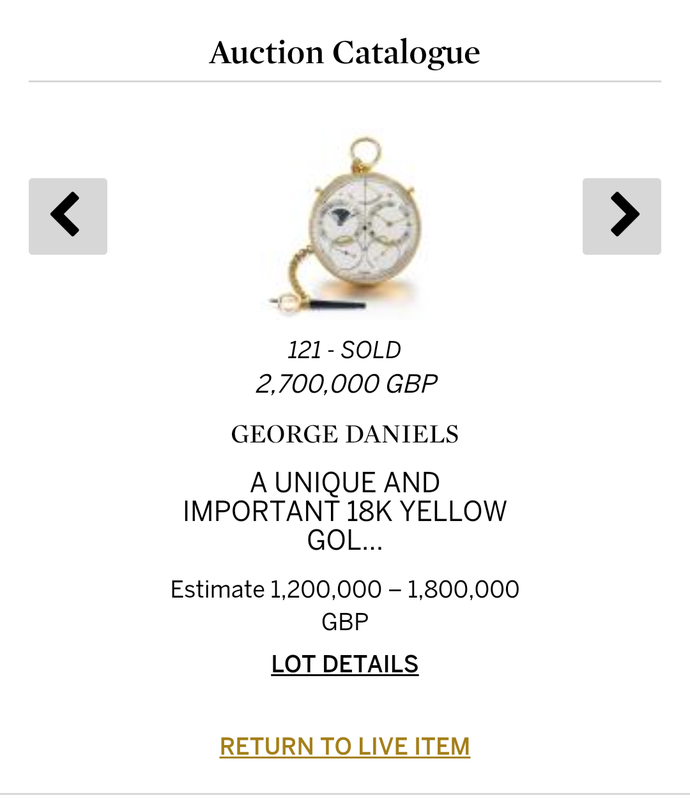 Lot 121 in the Sotheby’s ‘Fine Timepieces including George Daniels Masterpieces) collection, aka the ‘Space Traveller’ achieved a hammer price of 2,700,000 GBP yesterday at auction yesterday, for a grand total of 3,196,250 GBP including the buyer’s premium. 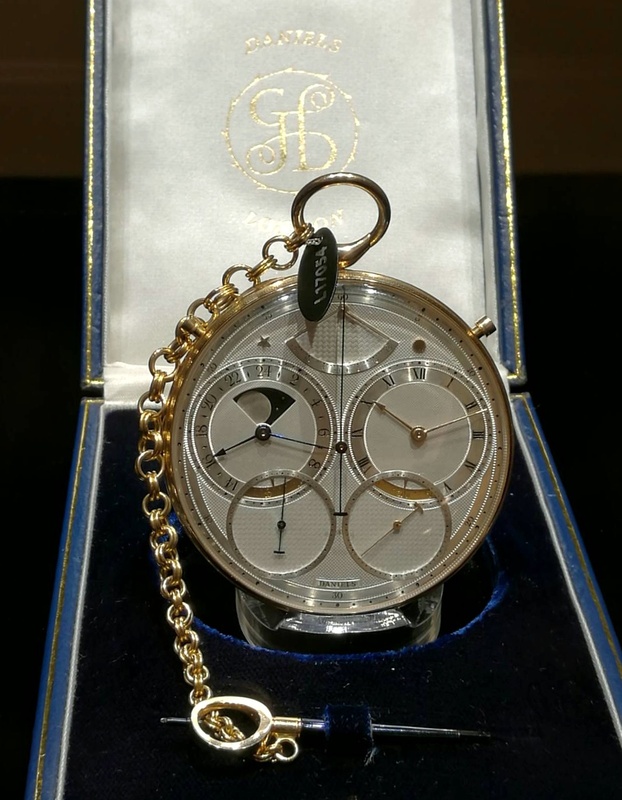 The pocket watch had previously been sold by Sotheby’s in their sale ‘The George Daniels Horological Collection’ 6th November 2012 for £1.33 million, and had a low estimate for yesterday’s auction. Named in honour of the 1969 lunar landing, it is regarded both as his masterpiece and as one of the great timepieces of horology. For details on the pocket watch and lot description, click here. For those who were attending the auction or watching online, there was an agonising wait near the end when it was unclear whether a phone bidder would continue. He did not, and just this morning, wrote some personal thoughts about having been the under bidder. There were five Daniels pieces in the sale. 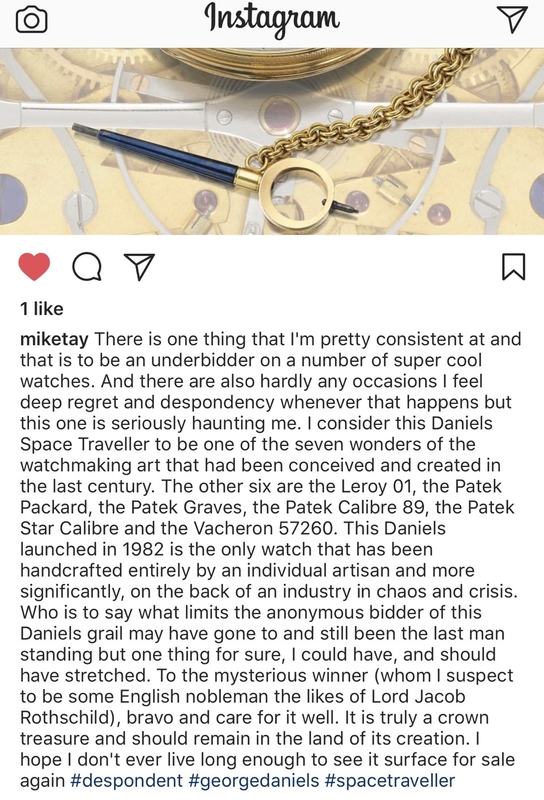 His Omega Co-axial watch with a very low estimate went for 12,500 GBP (including buyer’s premium), the Daniels/ Mercer Chronometer for 52,500 GBP (including buyer’s premium) and a Millenium for 200,000 GBP (including buyer’s premium). The Daniels/ Breguet ‘Breguet et Fils No. 3225’ three-wheel clock failed to sell. To view all the lots and download the results from this auction, click here.